Tami made me do it! 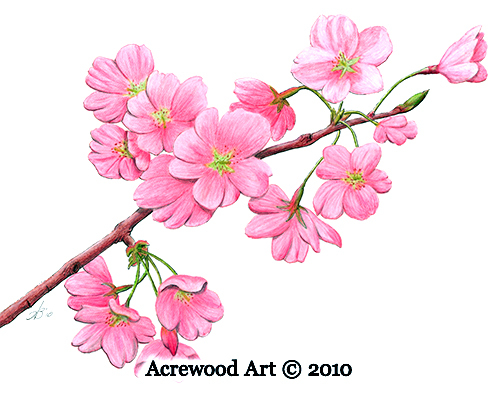 She asked me to draw cherry blossoms for her business note cards because of what they symbolize. To get just what she wanted, she took a walk on the Portland waterfront to photograph the cherry trees there, then sent me several of her photos to use. By extending what she wanted for her cards, we are able to use the idea for Acrewood Art as well. I enjoyed doing the flowers after drawing so many buildings and bridges lately. Tami is a Certified Health Coach who specializes in helping women with fibromyalgia find hope and freedom. You can visit her website to read about her own journey with fibromyalgia and how she's helping women who are tired of being held prisoner in their own bodies: www.MyRestoredHealth.com.